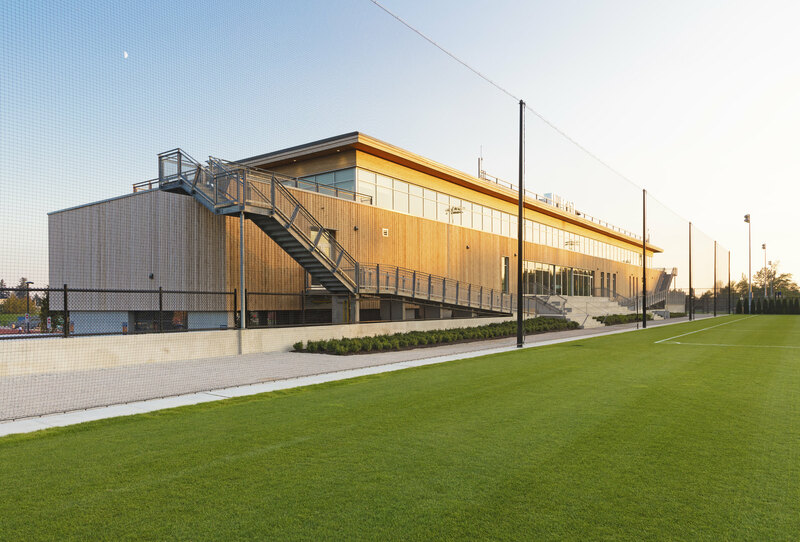 The Whitecaps FC National Soccer Development Centre (NSDC) at the University of British Columbia, built in partnership with UBC and the Government of British Columbia, features a three-storey, 38,000 square feet state-of-the-art fieldhouse; a design partnership between BBB Architects, internationally recognized sports architects, and Acton Ostry Architects, an award-winning architectural firm based in Vancouver. In total, the multi-campus NSDC also includes seven fields – two artificial turf fields at Simon Fraser University, and five (three grass and two artificial turf fields) constructed, refurbished, and improved fields at UBC. The WFC NSDC at UBC is home to the Whitecaps FC first team, and the club's U-19, U-17, and U-15 boys Academy teams. Approximately 200 players, coaches, and staff are based out of the building. Two-story weight room with glass windows on one end and a fully-mirrored wall on the other, creating a stunning, panoramic view of the new grass fields and surrounding mountains.